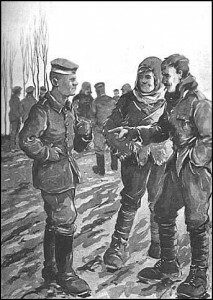 By far my favorite story about the celebration of Christmas is the Christmas truce of 1914. On the night of December 24th, entrenched and fully engaged in deadly combat, German soldiers in Ypres began to observe Christmas festivities. They lit candles, decorated a tree, and began to sing carols. After a short while, the British troops in the opposing trenches began to sing carols of their own. Singing led to laying down arms, and soon the soldiers who had been and would continue to be at war with each other were leaving their trenches, exchanging gifts, playing f ootball and even giving each other haircuts. I cannot imagine a celebration of Christmas more fitting. That buying the best gifts and throwing the best parties is a poor way to celebrate Christmas is a truism so tedious that I hesitate to even mention it. Charles Schultz has expressed the spiritual failures of a commercial Christmas as well as anyone will need to in my generation, and perhaps in many yet to come. Yet as I watch the ways in which we try to eschew the easy trap of commercialism for better means of celebration, I wonder if even these better ends would turn out to be cheap if we could find a way into the spirit that made enemies into brothers in Belgium. An impossibly ironic phenomenon in recent Advent seasons has been the “battle” over the public celebration of Christmas. Christmas is a thing so powerful that it stopped a world war just by existing, just by the nature of what it is. That so many have believed that one either can or ought to do battle over it seems to me to be proof that they have not seen the thing at all. The thing itself simply, easily and absolutely dispenses with battle. I suspect that one aspect of this failure comes from our tendency to locate Christmas either in the far past, or in the distant future. When we walk through the season of advent in liturgical practice, we primarily look back on the first coming of Christ and forward to his future coming. So I wonder, when we hear words like peace and goodwill bandied about in carols and Christmas readings, whether we think either quite locally about those few people nearest to us for whom we already feel goodwill, or far into the future towards a time when at Christ’s second coming peace will come through the final elimination of all enmity.